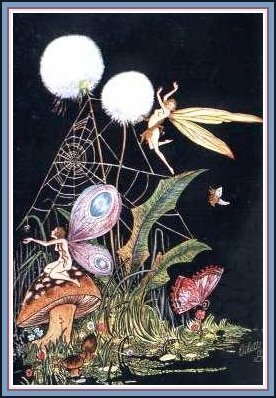 The best times to cath a glimpse of fairies are 'tween times. Shadow time ~ dawn, dusk midnight. Autumn and Spring are the best times as well. Fairies are said to live in places that are not really anything. Shadow lands - the banks of rivers, a bend in the road, an island off shore, can be a fairy abode. You can't really say, cay you? Some fairies appear beautiful, some withered and old. Some are too small to be seen. Fairies use glamour to hide themselves from prying human eyes. It can be said that in most observances of fairies, they are wearing some kind of flower, leaf, or moss. One special place for the fairy race is an enchanted place called Tír na nÓg. This island is said to be off the coast of Ireland. In Tír na nÓg time seems to stand still and it is a place of youth and beauty. Flowers always bloom, there is no sickness or war. A fairy land indeed. Few mortals have also called this place home, having been carried there by Sidhe. Fairy Paths~ These paths are said to run all across Ireland. Humans have been warned not to build upon these paths, known as Ley Lines, for they are underground lines of force of magical happenings, and strange things would happen to those who dwell there. Fairy Raths~ The ancient ruins of raths are still believed to be ruled by the Sidhe. People believe that walking over these places will cause bad luck. Bean Sidhe (ban-shee) Ireland. This spirit is attached to families and when a member of the family is approaching death, the banshee wails. Brownies- Many names in different regions. These beings are about 3 feet tall, wearing all brown as a rule. Brownies often take on responsiblities for the house where they live, doing unfinished work. A bowl of milk and some cake will make them happy. Caoineag (konyack) Scotland. The weeper, a type of banshee. Coblynau (koblerneigh) Wales - Mine sprites. About a foot and a half tall, dressing like miners. These beings are not attractive but are good humored and helpful in finding rich ores. Cyhyraeth ( kerherrighth) Wales - This is another form of banshee. The wail of the Cyhyraeth can usually be heard before multiple deaths. Daoine Sidhe ( theena shee) Ireland - This is a name for fairy people. Dryads - The dryads are known through out all Celtic countries. These are spirits living in trees and are protective of their trees. Ellyllon ( ethlerthlon) Wales - Fairies whose queen is Mab. Elves- This is another name for the Trooping Fairies of Britain. Also a name used for small fairy boys. Fairies/Faeries- Also called Fays. Some fairies are friendly, some more mischevious. Some live above ground, some under or in lakes and seas. Fairies use glamor to hide themselves from humans. There are many ways to protect yourself from fairy magic. Running water deters them, turning your clothes backwards , inside out will confuse them. Bells will also deter them.Other names for fairies are Fenodrerr, Ferrishyn, the GEntry, the Old People. People of Peace, People of the Hills, Pixies, Seelie, to name just a few. Hounds of the HIll - These are the hunting dogs of fairies. They are said to be very large, white, with red ears. Gwartheg Y Llyn - Wales - These are the fairy cattle. These are also said to be white, sometimes with red ears. Phouka (Pooka) Ireland - This spirit can take the form of many different animals and is considered to be dangerous. Kelpie -A spirit of the water, said to resemble a great horse with reeds for a mane. This forse will trick people into riding and then drown them in its lake. Avalon - Apple Isle - This is a Celtic paradise across the sea where Gods and heros were fed on apples. Tir Na Nog Ireland - Fairyland. A place of youth and immortality.